Environmental management and flexible configuration via Web Browser. The SSL-EMD allows you to remotely monitor the temperature, humidity, and status of two contact devices. 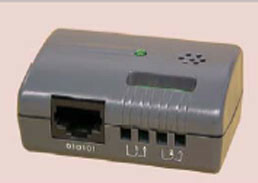 Through the SNMP-SSL card, the user can monitor it and receive notifications of the alarms. When the SSL-EMD is plugged into the SNMP-SSL card’s COM port, temperature and humidity readings are automatically displayed on the SNMP-SSL card’s “Comprehensive View” page. If enabled, the status of the external contact device is also displayed on the same page.